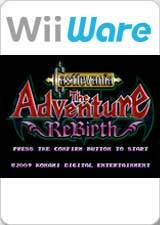 Castlevania: The Adventure ReBirth​ (ドラキュラ伝説 ReBirth, Dorakyura Densetsu Ribāsu, The Legend of Dracula ReBirth) is a side-scrolling action platform game developed by M2, and released by Konami for the Wii in 2009 as a WiiWare title. Based on the 1989 Game Boy title Castlevania: The Adventure, it is the third game in M2's ReBirth series, following Gradius ReBirth and Contra ReBirth. The setting of the game takes place a century before the original Castlevania title, where the player controls an ancestor of Simon Belmont named Christopher Belmont, who must defeat the vampire Dracula. After selecting start from the menu and the the intro animation playing a black screen appears and no futher progress occurs. Disable Enable Dual Core to resolve this. Refer issue 8538 and issue 7143. Most cutscenes will have random colors flashing at the background. Disable Store EFB Copies to Texture Only to fix that. The graph below charts the compatibility with Castlevania: The Adventure ReBirth since Dolphin's 2.0 release, listing revisions only where a compatibility change occurred. 3.0-368 Windows 7 AMD Phenom II X4 965 ATI Radeon HD 4870 100-105FPS,OpenGL,no problems of any kind what so ever. 3.5-367 Windows 7 Intel Core i5-2400 @ 3.1GHz NVIDIA GeForce GTS 450 60FPS,OpenGL won't work, Direct3D9, works perfect. This page was last edited on 10 February 2019, at 00:45.